Here’s the picture: you just got sparkling new computer. You tear open the box, pop all the bubble wrap (to annoy your wife) and then login for the first time. After a few eternal minutes you’re staring at the desktop background but your excitement immediately abates when you realize you don’t have all your programs so now you have to Google each one and install them individually. Or perhaps your computer isn’t new but the hard drive is. After hearing all the brouhaha about Solid State Drives (SSD), you purchased one on Amazon with stellar, installed the operating system and now need to get your favorite programs on like VLC Player and Chrome. How are you going to get everything back on your PC? You could copy each program to a removable drive and then manually install each one on your new machine – but that’s an onerous process. I mean, who really wants to spend hours doing that? Isn’t there a better way to install everything you want at once and then forget about it? Ninite is both free of charge and free of ads; rare combo these days. The program was created by Patrick Swieskowski and Sascha Kuzins with the aim of providing a simple, single source for downloading common applications. 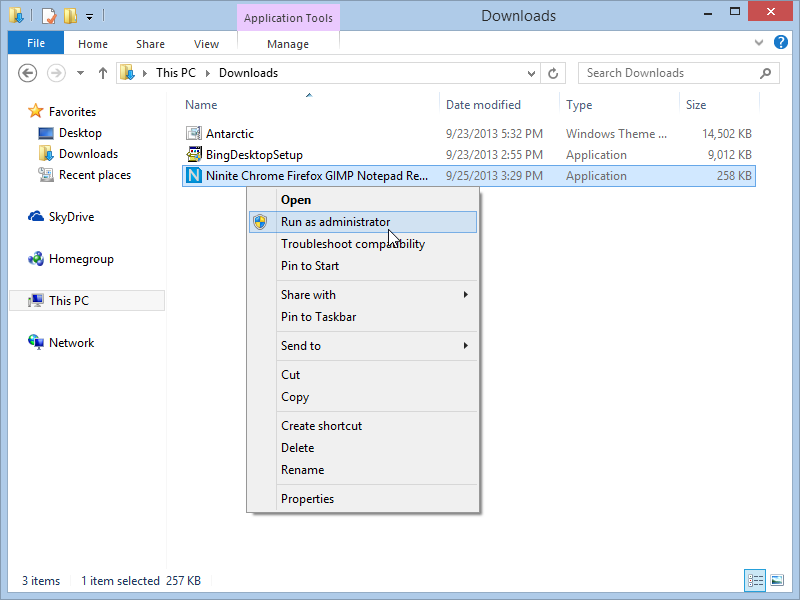 The program supports 64-bit apps, has zero options and all apps are installed in their default locations. The install works in the background so you can continue to do your work without being bothered with stupid pop-ups or reboot requests. I wanted to get a few of my favorites apps on my new Windows 8.1 VirtualBox so I checked them off and clicked Get Installer. My selections are in green below. 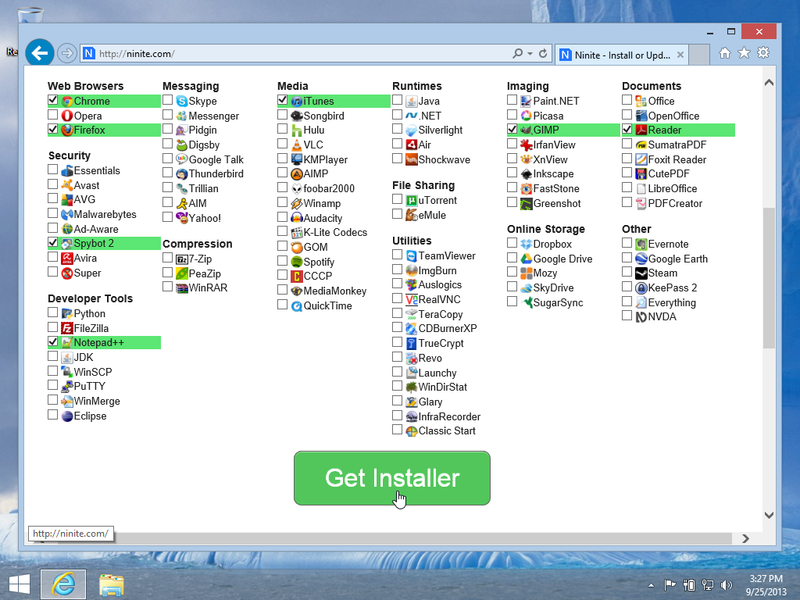 When you click Get Installer, Ninite creates a customize executable package that only contains the files you selected. You may encounter a SmartScreen error when attempting to run the file in Windows 8.1. 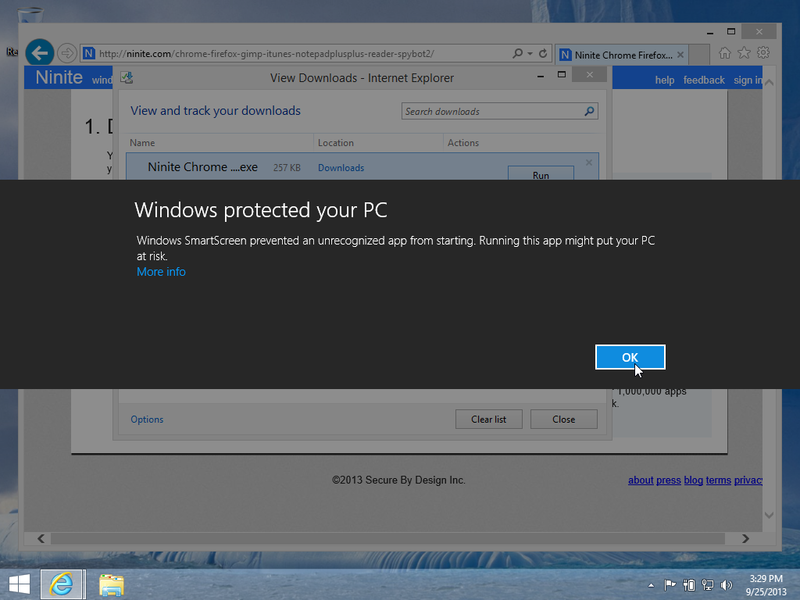 SmartScreen is an standard Windows feature that compares downloaded files against a known list of malicious software sites. If SmartScreen matches the file against the list then it blocks the program. Usually, Smartscreen doesn’t get in the way; however, it isn’t perfect and will occasionally block valid software. If this happens to you, right click the Ninite package and choose Run as administrator. If you click Show Details, the bottom part of the window slides down which reveals the install status of each of your requested packages. If a package fails for some reason, like Spybot 2 did for me, you can click the blue retry/re-install link or choose Get help on failed or skipped applications to troubleshoot the problem. All the programs in custom packages are current to the day and the package library is constantly growing. In fact, if you can’t the program you want on the Ninite homepage, you can submit a request by clicking the Show suggestion form link near the bottom left side of the webpage. Just enter the App name and email address and Ninite will send you a note once the app arrives. Keep in mind; however, that only popular apps are add though. 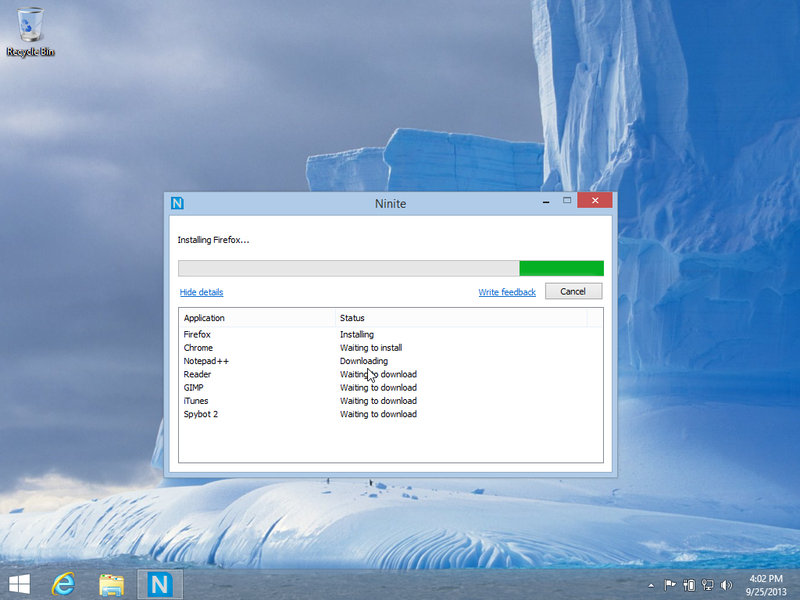 Do you use Ninite or ever try other all-in-one-app-programs like this one? Let me know in the comments!